Enjoy the local highlights of Ispra and Lake Maggiore, from this spacious family villa for 8! 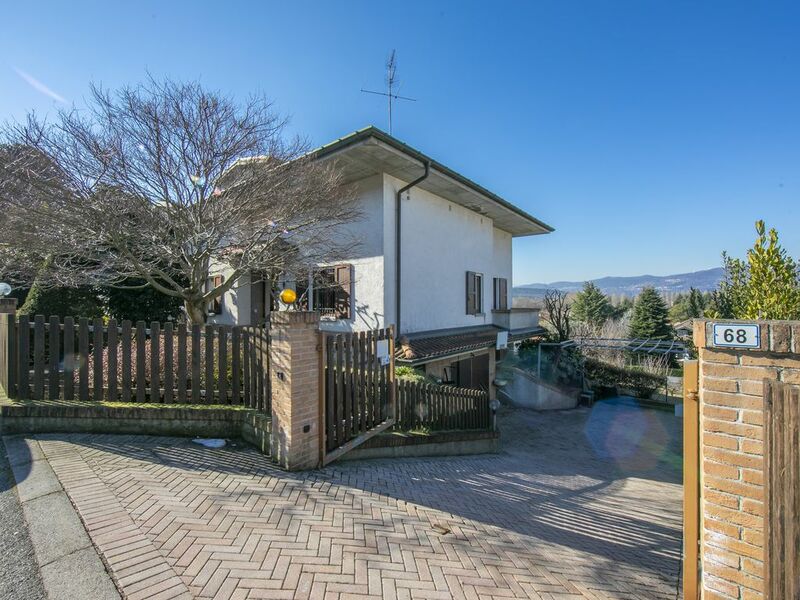 Located within easy driving distance of Ispra and the top attractions of the eastern shore, this modern detached 4-bedroom, 3-bathroom villa offers the perfect base for laid-back stays on Lake Maggiore. Inside, the timeless villa enjoys a lovely main living room, with flat screen TV, a timeless book-games library and free WiFi provided for guests’ amusement. An ambient wood-burning chimney offers added home comfort in the cooler months, whilst the living room wraps around to a light, airy sitting area with work desk and outdoor access, ideal for those seeking an effortless year-round flow. To the same floor, a well-equipped kitchen diner provides a welcoming space in which to rustle up a homecooked meal, or a simple, easy snack. The kitchen diner is accompanied by a covered secondary dining area with outdoor access and a partially-covered balcony with alfresco dining set (reached from the main living room). Downstairs, an ambient lower ground floor features a cosy sitting area with romantic open fireplace, alongside a smaller 2nd kitchen, a dining space and a shower room. The sleeping accommodation is ideal for families and flexible groups of 8. To the ground floor, a generous double king-size bedroom is accompanied by a family shower room. To the 1st floor, a double-king size bedroom, 3rd bedroom with twin joinable beds, a 4th bedroom with 2 separate single beds and a family bathroom suite are provided. Outside, a pretty, private garden and the balcony’s scenic alfresco dining set will tempt guests to relax and enjoy some summertime moments in the sun. The 3-storey villa also benefits from private laundry facilities and private parking. Popular nearby Lake Maggiore highlights include Parco del Golfo delle Quassa (6 minutes’ drive), the water sports and family appeal of Ispra (6 minutes’ drive), the UNESCO world heritage site of Santa Caterina del Sasso and the ferry links and buzzing resort amenities of Laveno-Mombello (22 minutes’ drive). The picturesque family villa is located along the quiet secondary road of ‘Via Francia’, 12 minutes’ walk away from the nearest authentic restaurant. The villa is also 6 minutes’ drive from the lakeside park of Parco del Golfo delle Quassa and central Ispra, where a host of family-friendly shops, eateries, amenities, outdoor sports and water sport opportunities await. For those seeking a sightseeing opportunity, the UNESCO world heritage site, Hermitage of Santa Caterina del Sasso, is just 17 minutes’ drive away. The family-friendly resort amenities and Lake Maggiore ferry and regional train links in Laveno-Mombello are also within easy driving distance (22 minutes away). Other local Lake Maggiore highlights include Rocca di Angera castle, the Borromean Islands and the resort towns of Intra, Stresa, Arona and Pallanza. For those flying in, Milan Malpensa airport is 39 minutes’ drive away.